Dimensions: Approx. 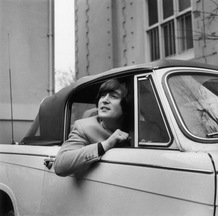 10.75" x 10.75"
Singer, songwriter and guitarist John Lennon of The Beatles in his Triumph Herald convertible car. Copyright Getty Images.